I tried out these rolls on Little Miss S’ class last week. They were quickly snatched up by all the parents – I even saw someone make two turkey sandwiches to take home! These were buttery, fluffy, slightly sweet and reminiscent of Hawaiian rolls. I told M I would make these for Thanksgiving which I plan on making a few days in advance. All the breads I have ever made freeze really well with no noticeable change in flavor or texture. 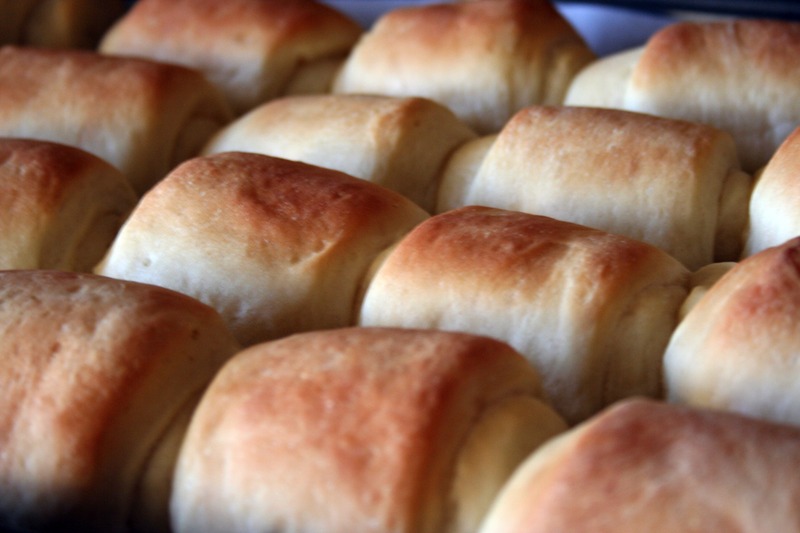 Now that I’ve successfully made them once, I know what to expect, and maybe I will actually get a full 24 mostly equally sized rolls out of this recipe. Thanks for reading, enjoy! In a large bowl, combine the yeast and water. Let stand 5 minutes (no need to do this if using instant yeast – just add the yeast and water together with the other ingredients). Add sugar, butter, salt, dry milk, 2 cups flour and egg. Beat together until very smooth. Add remaining flour gradually (about 1/2 cup at a time) until a soft but not sticky dough is formed. Knead the dough for at least five minutes if using an electric mixer and for at least 10 minutes if mixing the dough by hand. When the dough is smooth, supple and elastic, place it in a lightly greased large bowl covered with greased plastic wrap and let it rise until doubled. Separate the dough into two portions. Roll each section out to an 11X14-inch rectangle. Brush the top with melted butter. Using a pizza cutter or sharp knife, cut the dough into two pieces, the long way (see photos below). Then slice the dough into five or six strips across so you end up with 10 to 12 small rectangles. Roll each small rectangle up like a snail and place on a silpat-lined or lightly greased baking sheet with the roll resting on it’s open edge. Repeat with the second portion of dough.